WYATT Tier Set Rustic Cabin Lodge Woodland Hunting Plaid Khaki/Green Lined 36"
Nothing says fresh farmhouse style like our new Sawyer Mill Chicken Valance. The classic and unique design of the distressed, country chicken on chambray along with inverted pleats gives this farmhouse curtain a rustic feel. Hang panels with the stars in the middle opening, or switch the panels to line the stars along the outer edge of the window - two looks in one! Burlap Black Star Panel Set. Fabric: 100% Soft Cotton Burlap. A lightweight dark tan tobacco cloth covers your door in sheer elegance with its soft and simple texture. Tobacco Cloth Khaki Door Panel. 1 Door Panel (72" x 40"). 100% cotton. Burlap Tobacco Cloth Khaki Prairie Curtains by VHC Brands - 63" x 36"
(1) Burlap Tobacco Cloth Khaki Prairie Curtains (Includes 2 panels). They have a 3.25" rod pocket. Sold as a set of 2 pcs (mirror images of each other). Size: 63" Length x 36" Width x 18" Drop. 100% Cotton. 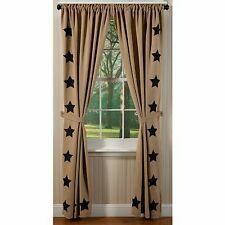 (1) Black Star Scalloped Prairie Curtain Set (Includes 2 panels). Sold as a set of 2 pcs (mirror images of each other). Our Goal is to provide the best quality and selection of primitive, country, and rustic style products on the web. Bring a farmhouse mood to your window with the Sawyer Mill Charcoal Chicken Pleated Valance. This farmhouse valance features textured, solid cotton chambray base with a chicken in center stenciled with distressed color, accented with pleats on either side, underside of pleat lined with contrasting colored microcheck fabric. This red and dark tan country curtain features a rod pocket for easy hanging, lined, 100% cotton, and machine washable for easy maintenance. Sawyer Mill Red Ticking Stripe Valance 60". 1 Valance (16" x 60"). The Sawyer Mill layered valance tastefully combines plaid with ticking stripes separated by a check pattern pointed edge with buttons to create the perfect blend of farmhouse elegance and country charm. Sawyer Mill Blue Ticking Stripe Balloon Valance. Coordinates well with the Sawyer Mill Blue Ticking Stripe bedding. 1 Balloon Valance (15" x 60"). 100% Cotton machine washable. ined - 100% cotton. Add a little natural warmth to your rustic abode with the Ridgeline Swag Curtain Scalloped Set of 2 36x36x16. This rustic curtain features earth tone green, brown, and tan plaid that captures the essence of rustic, lodge, and cabin design; lined with white cotton and finished with a scalloped edge. Burlap Natural w/Burgundy Stencil Stars Short Panel Set by VHC Brands - 63"x36"
(1) Burlap Natural w/Burgundy Stencil Stars Short Panel Set. These panels are 100% cotton. Tie backs in matching fabric are also included. Our Goal is to provide the best quality and selection of primitive, country, and rustic style products on the web. Cumberland Plaid Panel Set. Set contains two panels with tiebacks. Lining: White Cotton. Care instructions: Machine washable. Color: Red, Black. Fabric: 100% Cotton. This red and dark tan country curtain features a rod pocket for easy hanging, lined, 100% cotton, and machine washable for easy maintenance. Sawyer Mill Red Ticking Stripe Valance 72". 1 Valance (16" x 72"). Bring a farmhouse mood to your window with the Sawyer Mill Charcoal Ticking Stripe Panel Set. Sawyer Mill Charcoal Ticking Stripe Panel Set. I have all the accessories you need to make your quilt ensemble complete. Featuring navy plaid applique stars along the scalloped border on a striated khaki cotton base fabric. Lined with white cotton. Vincent Scalloped Prairie Curtain Set of 2 panels. 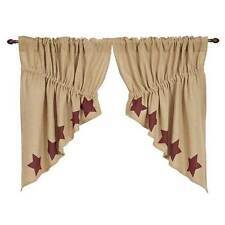 1 Prairie Curtain Set. Style: Country Farmhouse. Black Buffalo Check Valance. If you need more, mate them together on one rod and the ends will be hidden in the folds. Size: 16" high x 72" wide 2" header. Lining: 100% White Cotton. 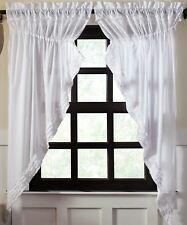 This country curtain features a rod pocket for easy hanging, lined, cotton, and machine washable for easy maintenance. Sawyer Mill Red Ticking Stripe Tier Set. 1 Tier Set (24" x 36"). I have all the accessories you need to make your quilt ensemble complete. 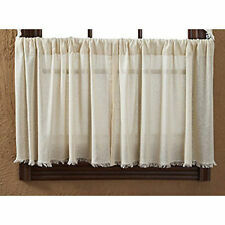 This country curtain features a rod pocket for easy hanging, lined, cotton, and machine washable for easy maintenance. Sawyer Mill Blue Ticking Stripe Tier Set. 1 Tier Set (24" x 36"). I have all the accessories you need to make your quilt ensemble complete. One NEW valance. 72"W x 16"H. Washable. 3.25" rod pocket. Bring a primitive look to any window with the Kettle Grove Plaid Panel Curtain Set with its black and tan micro check fabric. Includes 2 matching tie backs. Sold as a set of 2 matching panels. 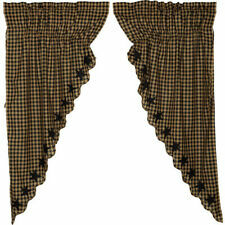 Kettle Grove Plaid Panel Curtain Set. Country red and dark tan plaid present a refreshing, farmhouse look to brighten up your space. This country curtain features a rod pocket for easy hanging, lined - 100% cotton. Sawyer Mill Red Plaid Balloon Valance. Finished with inverted pleats and stripes towards the bottom for a touch of country charm. Sawyer Mill Blue Windmill Pleated Valance 72". 1 Valance (20" x 72"). 100% Cotton machine washable. Bring the primitive look to any room with the Stratton curtains, made from 100% soft cotton burlap with appliqued primitive stars in red, orange and yellow. The set includes 2 panels and 2 matching tie backs. The swag is lined with white cotton for a quality finish. Tumble dry low, remove promptly. The checks are a dark, rustic tan. Lined with white cotton. Small scale burgundy and tan check. Just didn't like it?. Plaid presents a refreshing, farmhouse look to brighten up your space. 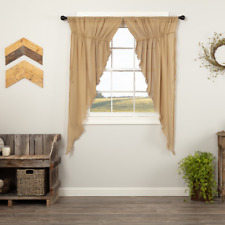 This country curtain features a rod pocket for easy hanging, lined, cotton, and machine washable for easy maintenance. Sawyer Mill Blue Plaid Tier Set. Complete the look of your farmhouse bedroom with the Sawyer Mill Red Patchwork Valance. Coordinating effortlessly with the Sawyer Mill bedding, fabrics from the quilt beautifully cover the country valance. Dress your window with the rustic look of the Plainfield Valance Block Border. RUSTIC DECOR: cabin style to fit any lodge, cabin, lake house, or retreat. Patchwork block border in assorted plaid fabrics. Country red and dark tan plaid present a refreshing, farmhouse look to brighten up your space. Lined, 100% cotton, and machine washable for easy maintenance. Sawyer Mill Red Plaid Swag Set. 1 Swag Set (36" x 36" x 16"). Tobacco Cloth Natural Tier Set by VHC Brands - 36" x 36"
(1) Tobacco Cloth Natural Tier Set (Includes 2 panels). These tiers are 100% cotton and sold in a set of 2 panels. Size: 36" Length x 36" Width. Our Goal is to provide the best quality and selection of primitive, country, and rustic style products on the web. 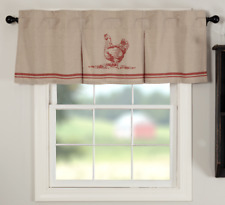 This country curtain features a rod pocket for easy hanging, lined - 100% cotton. 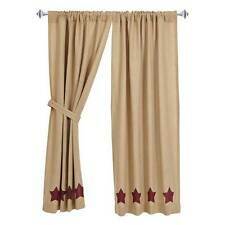 Includes 2 matching tie-backs to pull either one side or both sides of curtain back. Sawyer Mill Blue Ticking Stripe Panel Set. 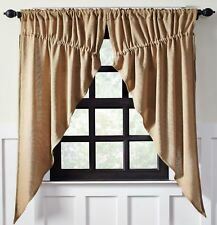 (1) pair of Tobacco Cloth Khaki Prairie Curtains. The Tobacco Cloth Khaki Prairie Curtain Set brings a. 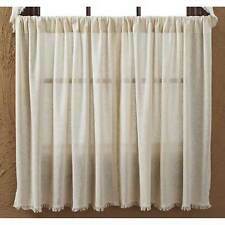 A lightweight khaki tobacco cloth drapes your window. No header and 3.25" rod pocket. Includes drawstring ties, 100% cotton. Bring a farmhouse mood to your window with the Sawyer Mill Charcoal Ticking Stripe Balloon Valance Curtain. Sawyer Mill Charcoal Ticking Stripe Balloon Valance. 1 Balloon Valance (15" x 60"). ined - 100% cotton. Kilton Red. The Kilton Red Panel Lined Set boasts large scale plaids of brick red and forest green mixed with accenting lines of gold for a little country flair. Large-scale brick red, forest green, and gold tartan plaid. Tobacco Cloth Natural Tier Set by VHC Brands - Lined - 24" x 36"
Burlap Chocolate Tier Set by VHC Brands - Unlined - 24" x 36"
Burlap Natural Curtain Short Panel Set by VHC Brands - 63"x36"